These are the words that begin just about every recipe for a Cajun dish (except desserts). All Cajuns know how to make a roux, but for people who don't here are links for a detailed recipe for traditional, microwave and oven roux: Traditional Roux Recipe (Blonde), Microwave Roux Recipe, Oven Roux Recipe, and a most important element of Cajun cookery, The Holy Trinity of Cajun Cooking. There are as many ways of making a roux as people are cooking it, and most methods are just fine. First I want to tell you about the history of this simple blend of flour and fat: quite a history for something with just two ingredients. Roux has been thickening savory dishes for centuries. Its first incarnation was in France and made with butter and flour. This mixture is only heated for a few minutes—just enough time to cook the flour—and is the base of many sauces (including white or béchamel sauce) as well as soups and stews. Butter is the fat used, as butter is typical in French cooking (rather than the lard or oil used in Cajun roux). 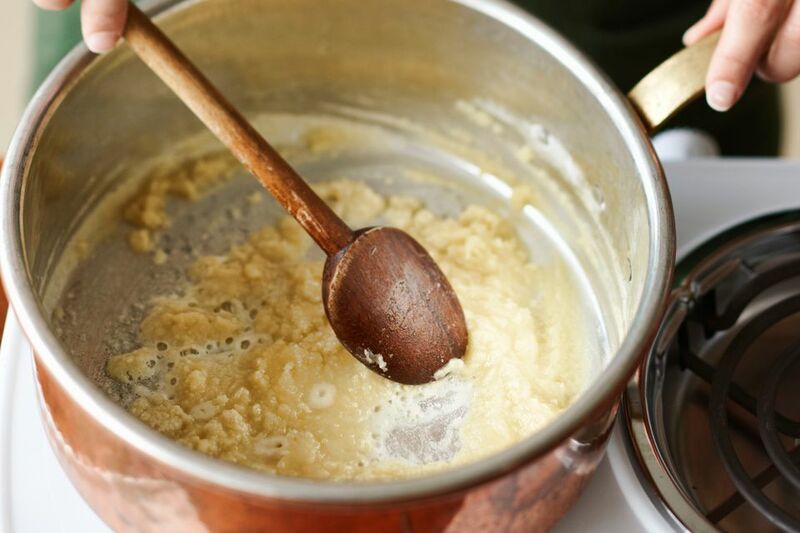 A butter-flour roux is most often used as the base of a sauce to which milk, cream or broth is added, and cooked for only minutes as butter would burn if cooked at a high temperature, or for a long time. The butter-flour mixture can also be made ahead and kept in the refrigerator to use whenever a dish needs to be thickened. This achieves the same purpose as the better-known buerre manié, a paste made by mixing equal amounts of flour and soft butter. Buerre manié is often made at the last minute when it is realized that a stew, soup, or sauce is not thick enough. The cook frantically mixes soft butter with flour and stirs it into the hot sauce, stew or soup in increments, until enough has been added to achieve the desired consistency. Like roux, buerre manié can be made ahead and stored, covered, in the refrigerator for a couple of weeks. A good thing to have around if you do a lot of cooking. “Thickening of flower. Melt some lard, take out the mammocks; put your flower into your melted lard, seeth it well, but have a care it stick not to the pan, mix some onion with it proportionably. When it is enough, put all with good broth, mushrooms and a drop of vinegar. Then after it hath boiled with its seasoning, pass all through the strainer and put in a pot. When you will use it, you shall set it upon warm embers for to thicken or allay your sauces”. If the idea of lard seems unhealthy, allow me to mention that lard is lower in saturated fat than butter (7 grams saturated fat per tablespoon of butter; 5 grams saturated fat per tablespoon of lard). Lard is also lower in cholesterol than butter at 10 grams of cholesterol per tablespoon of lard as opposed to 30 grams cholesterol per tablespoon butter. Lard contains no sodium, while butter has 90 mg sodium per tablespoon. Roux, in today’s culinary lexicon, usually refers to Cajun roux, which mixes oil or lard with flour and is generally cooked in a cast iron pan on the stove top over medium heat for a long time. Nothing is wasted in a Cajun kitchen, and it made no sense to discard one fat (drippings from a roast, or lard from the annual Boucherie, or pig slaughter) and replace it with another fat. Lard gives a smooth, rich flavor and texture to both savory and sweet foods. Roux made with lard is particularly flavorful, and biscuits and pie crusts made with lard are wonderfully flaky and light. The amount of time it takes to brew and drink a pot of coffee.